With Automotive Carpet Dye you can rejuvenate your car or truck carpeting. Should you use automotive carpet dye to rejuvenate the dirty, stained carpeting in your celestial chariot or not. Let’s pretend a little. Hi!!! I’m the salesman for Auto Custom Carpets Inc and I want you to buy an entire new piece of carpeting for your vehicle. Nooooo …. Not Really!!! I know Auto Custom Carpets is the largest manufacturer of custom replacement carpets for cars, trucks and spaceships but I’m not a salesman for ACC and there is another alternative to removing the guts of your truck or car and fully replacing the carpeting that’s a lot less expensive. Besides, who knows what lurks beneath your car carpeting!!! Yuck!!! I certainly don’t want to find out what’s under mine and don’t tell me about yours. Here's a tip to help keep your carpet as long as possible before you have to dye or replace it. My Mr. Kleannie Weannie character will show you the way. His tip helps prevent moisture and dirt buildup between your mats and the carpeting in your vehicle. Novel idea, Huh? OK, so even though you've done all you can to keep your vehicles carpeting in good shape it has been badly discolored, stained or damaged. You need to fix it inexpensively and an automotive carpet dye is financially acceptable and within your skillset. So let's see what we can do! Hey!!! I’ve always liked to color Easter Eggs and make tie dye t-shirts, not. Ya, it may sound weird, but if you’re one of “those people” then using an automotive carpet dye to restore your car’s carpet to its youthful state may be the thing for you. An auto carpet dye is an inexpensive method of fixing a lot of problems with the interior appearance of your vehicle. So read on and I’ll tell you what I know about using an automotive carpet dye to improve the appearance of your car carpet. The first type of auto carpet dye really penetrates the carpet material. Kinda like blueberries do when you squish them in your hand. This dye is usually applied as a liquid or sprayed on as an aerosol. Its advantages are low cost, quick job and lots of different colors to match your old carpeting. This type of automotive carpet dye can ultimately give you the best color match to your OEM colors. Before you use a product like this you really have to do a clean job on your cars carpeting with an auto carpet cleaner or steam extractor or something that really removes as much grease, dirt and stain as possible. You can check out my tips on auto carpet cleaning here. Then you have to be really careful and apply the dye according to the manufacturers instructions and recommendations. A good example of a company selling a pretty complete line of carpet cleaning and dyeing products is Superior Restoration Services Inc. You can get everything you need at Superior Restoration to dye your carpet, fix problems with leather and vinyl trim and lots of other interior and exterior problems with your vehicle. It usually takes anywhere between 5 minutes and a couple of days for the dye to become permanent so don’t do anything on your car carpeting in that time that I wouldn’t do! Some companies make a penetrating automotive carpet dye like Rekote(AerosolDyes). A similar product which is actually a paint is made by Plastikote. Of course we've all heard of RIT. 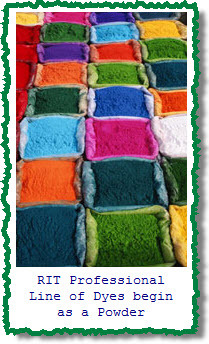 It is a household name for low cost dyes of all types. Their professional dye is sometimes used as a low cost automotive carpet dye and their page has some nice info on powder type dyes. The second type of automotive carpet dye is an aerosol vinyl. It doesn’t really penetrate your carpets fibers but rather it adheres to the outside of the carpet fibers and coats them with a flexible, wearable vinyl. This stuff can cover a myriad of problems that a regular dye cannot. For example, most dyes have trouble covering bleach stains but not this stuff. Most dyes don’t give you consistent colors on really dirty or faded carpets but aerosol vinyl just coats the carpeting – so who cares what the carpeting looks like underneath the vinyl coat. Aerosol vinyl is inexpensive and comes in a smaller collection of colors than a penetrating dye but it won’t crack or split. If it wears off over time just bring out the old spray can and go to it again, lightly! Daubert Industries ECP Division is a prime example of an automotive carpet dye manufacturer that uses aerosol vinyl as a base. Other manufacturers of aerosol vinyl used to color carpeting are Hi-Tech Industries, Burford /BAF Industries ProWax, Malco Products and SEM Products. (0) Follow the manufacturers directions and recommendations. (1) Clean your vehicles carpeting really really good. (2) Wear rubber gloves and eye protection. (3) Ventilate the area in which you are working. (4) Test spray a small area under the seats to make sure you like the color. (5) If you spray on the dye use a technique called bombing where you make many quick, light passes over the target area until its covered. (6) Overlap when you spray to get uniform coverage and colors. (7) Remove excess spray immediately with a white cotton rag. (8) Use tints to get the closest color match you can. (9) Brush the dried carpet with a not stiff nylon brush to raise the nap and loosen the carpet fibers. Tip: Remember a penetrating dye is meant to enhance or improve the appearance of your car carpeting, not cover a lot of problems. Use an aerosol vinyl to cover a greater range of problems. (1) Clean your vehicles carpeting really good. (5) Apply by following the manufacturers directions. (6) Spray light coats, not heavy coats. (7) Don’t use a brush to even out or spread the vinyl, it’ll leave tracks.